You must be a member of the New York And All That Jazz Group to attend this activity. Would you like to join this group? RESERVE HERE ASAP:Protected content w release Grace & Gratitude. Fourteen years after his first solo album came out, he now brings out his new recording, entitled GRACE & GRATITUDE. The lineup whom he has invited to work with him in the studio is exceptional: John Patitucci on the double bass, Jon Cowherd on the piano and Nate Smith on the drums form a veritable “all-stars” team to whom the happy Růžička has dedicated the first piece on the album, Brooklyn Brotherhood. The recording comprises exclusively Růžička’s own compositions and brings us jazz of the highest quality in first-class performance and in beautiful analogue sound performance. 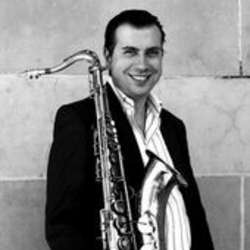 Award-winning saxophonist, composer and producer Karel Růžička Jr. was born in Prague, Czech Republic into a very musical family. His mother was in the Czech opera and his father, Karel Růžička, is a well-known jazz pianist, composer and educator. Karel studied piano and flute from age 5, and studied at Prague Conservatory and the Conservatory of Jaroslav Ježek. In early nineties a young Karel developed a successful career as a jazz saxophone and composer in Prague and he quickly became an in demand sideman and studio musician. From the beginning he had a singular goal to join his heroes in America. That vision became a reality when in Protected content paid a brief visit to New York City where he jammed in at Smalls and many other venues and where he met the trumpet great Roy Hargrove. He made quite an impression and in Protected content performed in Prague with Roy's Quintet. Růžička permanently relocated to NYC in the spring of Protected content his debut album You Know What I Mean which he released a few months later was nominated for a Czech Grammy. His second album Spring Rolls Quartet Protected content awarded Czech Jazz Recording of the Decade. In Protected content released his third album Brooklyn Moods with Bruce Barth on piano, George Mraz on bass and Brandon Lewis on drums, which was also nominated for a Czech Grammy. In Protected content has teamed up with Ondre J Pivec (organ) and Russell Carter (drums) to form the CPR Electrio. Their debut album was released in Protected content reveals a deeply creative exploration of groove-based modern jazz and was also nominated for the jazz album of the year. In October Protected content released his new quartet recording Grace and Gratitude with Jon Cowherd on piano, John Patitucci on bass and Nate Smith on drums. Since summer of Protected content is touring worldwide with the legendary jazz singer songwriter Michael Franks. Karel is featured on Michael's latest CD Music In My Head.